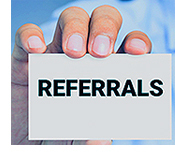 <p style="margin-bottom: 7px;">Research abounds showing that for many businesses, referrals are the most successful method for getting new clients.<sup style="font-size: 12px; line-height: 0; ">1</sup> A good referral is awesome: the client fits your practice and has a positive impression of you and the quality of your services. </p><p style="margin-top: 0; margin-bottom: 7px;">Building a steady stream of referral business takes time and dedication, but it’s worth the work because great referrals are worth their weight in gold. Here are a few tips to get you started on developing a referral strategy. </strong></p><p style="margin-top: 0; margin-bottom: 7px;"><img src="http://images.wisbar.org/Images/DigestEmails/LRIS_logo-scales.jpg" alt="" width="175" height="112" align="right"/>You can also consider joining the State Bar of Wisconsin’s Lawyer Referral and Information Service (LRIS) program. Our professional team of referral specialists screens more than 23,000 calls from potential clients every year to find the ones that are ideal for you. </p><p style="margin-top: 0; margin-bottom: 7px;">We start by learning your referral and business goals. Then we find the right clients for your practice by matching you with potential clients who are compatible with your practice areas and geographic location. Don’t miss the hottest ticket in town – the swearing-in ceremony for the 2017-2018 State Bar of Wisconsin President, Paul G. Swanson. The ceremony will take place at the 2017 <em><a href="http://amc.wisbar.org/">Annual Meeting & Conference</a></em> in Wisconsin Dells, June 15-16. </p><p style="margin-top: 0; margin-bottom: 7px;">Our incoming president, Paul G. Swanson, is a partner in the Oshkosh, WI law firm of Steinhilber, Swanson, Mares, Marone & McDermott. He is a board certified Bankruptcy Specialist in both Business and Consumer Bankruptcy by the American Board of Certification. </p><p style="margin-top: 0; margin-bottom: 7px;">His practice consists of representing individuals and businesses in financial reorganizations, restructurings, bankruptcy, receiverships, and other debt adjustment strategies. He received his law degree from the University of Wisconsin Law School in 1979. <ol><li>How many Justices originally served on the Supreme Court? </li><li>In what building did the Court first meet?